NMM 6719. 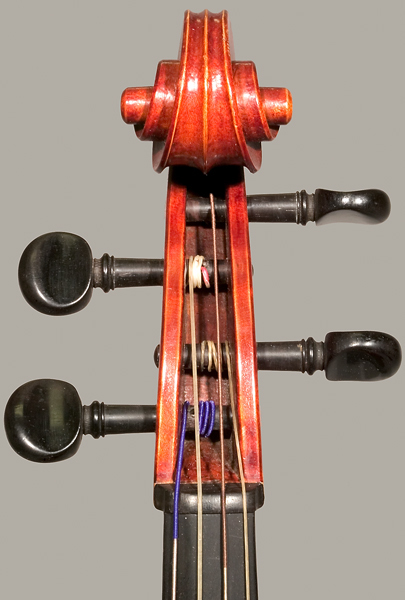 Violotta made in Richard Weichold/August Paulus workshop, Dresden, Saxony, December 1896. Stelzner System. Serial no. 325. Gift of Larry Anderson and David Folland, Northfield, Minnesota, 1998. Inscriptions: Written in black ink on brown paper label: No 325. Dresden, Dec. 96. / Dr. Alfred Stelzner inv. Top: two-piece, quarter-cut spruce: narrow grain broadening toward the flanks. 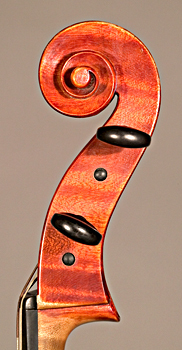 Back: two-piece, quarter-cut maple: broad curl descending from center joint. Ribs: quarter-cut maple: broad curl angled to right on bass side, angled to left on treble side; lower ribs divided by purfling strip; rib corners chamfered. Head and neck: maple: very broad curl; long pegbox with shoulders; neck angled steeply back. Edging: re-curve extends close to edge, forming ridge. Varnish: dark red with fine craquelure. 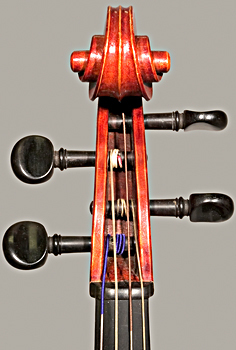 Fingerboard: ebony; beveled at G-string position. 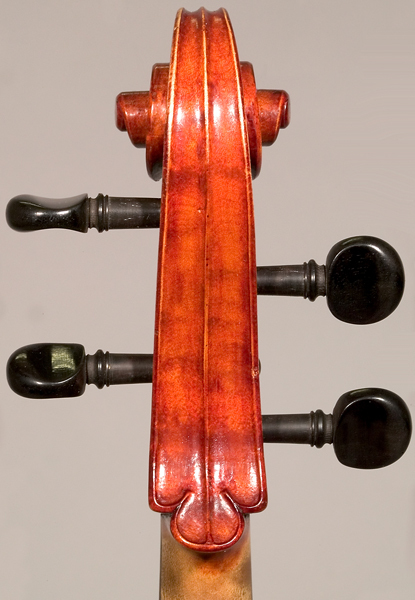 Tailpiece: ebony; fluted face with scalloped lower edge; molded saddle carved rather than inlaid. 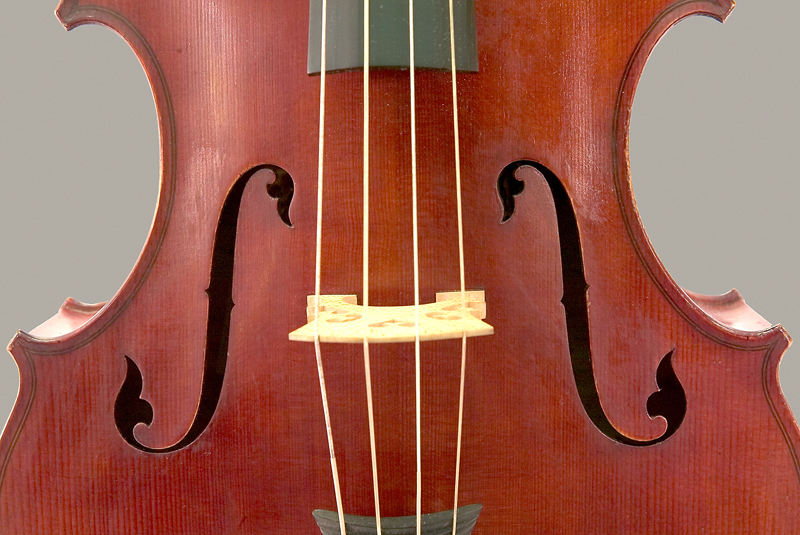 Bridge: tall bridge with fancy heart, small circular kidneys below angled, fancy kidneys, and tall, violoncello-bridge-style feet. F-holes: leaf-shaped eyes; rounded wings; notch corners rounded. Linings: light hardwood; extend over corner blocks. Top block: spruce; triangular with concave sides. 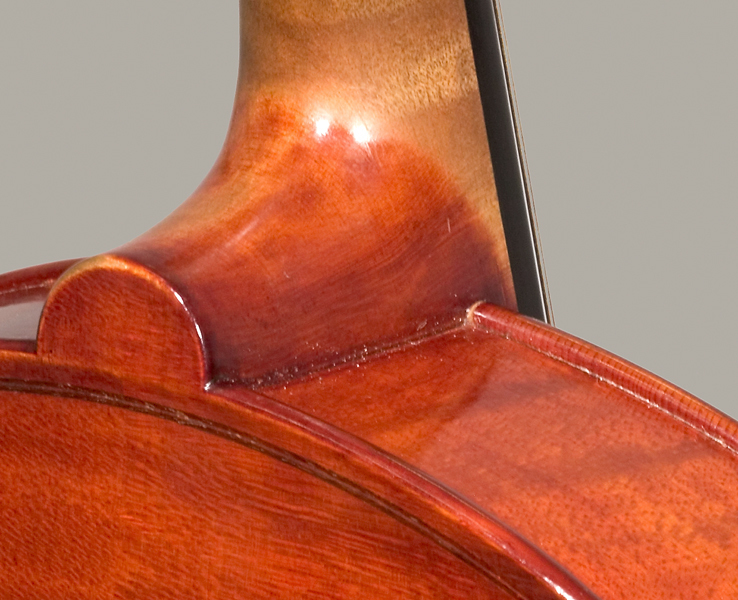 Bottom block: spruce; triangular with concave sides. 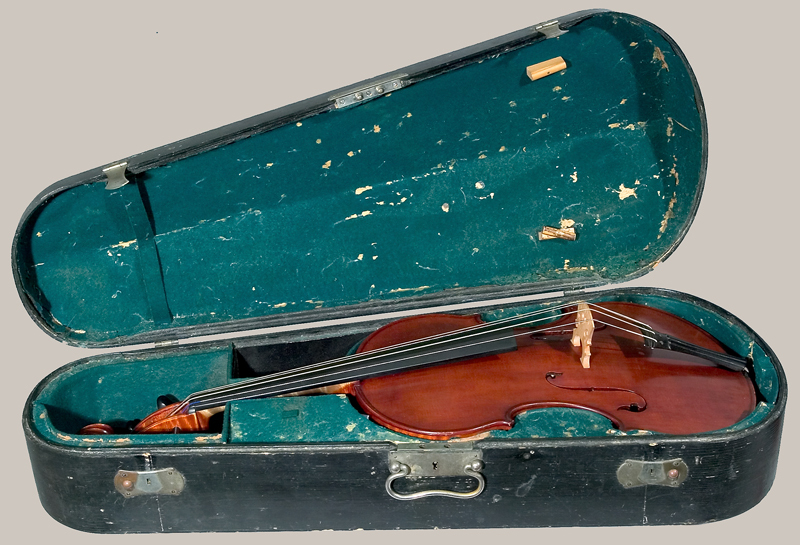 Original black-painted, pine case with green, wool-felt lining and nickel-plated brass hardware and handle. Lit. : Margaret Downie Banks, "A Physicist’s Unfulfilled Prophecy: Alfred Stelzner’s Experiment in Violin Reform," America's Shrine to Music Museum Newsletter 26, No. 2 (May 1999), pp. 4-5. 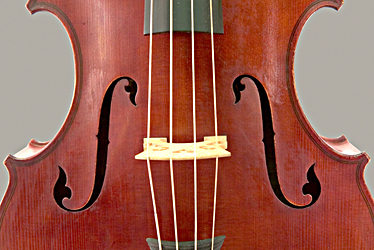 James Christensen, "Dr. Stelzner’s Original Instruments," The Strad 112, No. 1338 (October 2001) p. 1125.